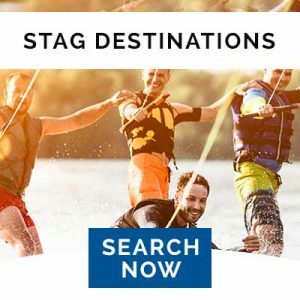 With all of the nitty-gritty planning occupying every spare moment you’ve got in preparation for your best mate’s stag do, it’s easy to neglect some of the essentials. Tragically, the all important pub crawl isn’t often missed off the list. 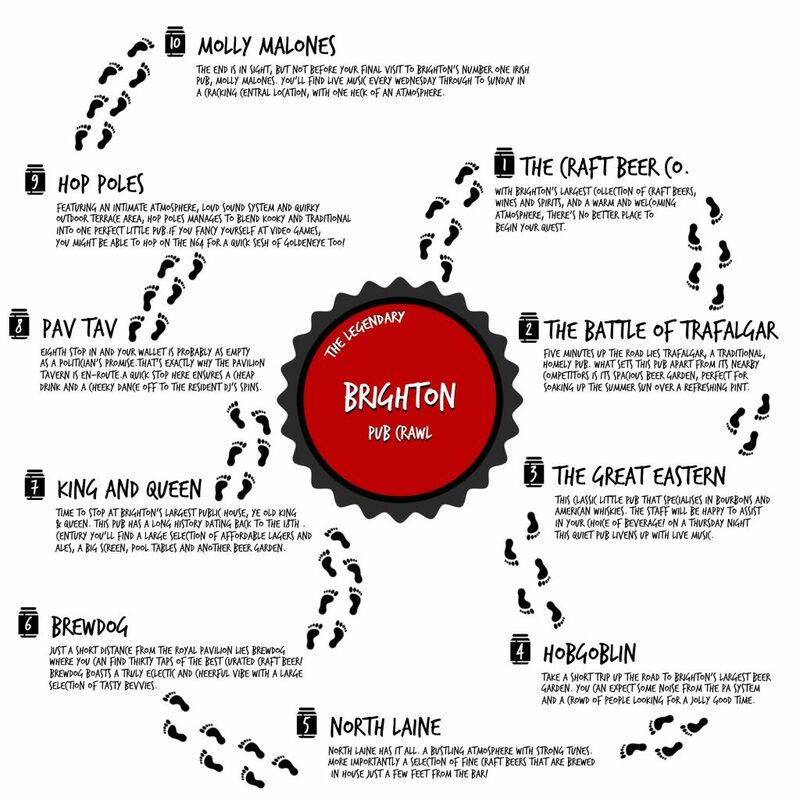 Luckily for you, Adventure Connections has put together a guide for an all round thrilling pub crawl in Brighton. Without a plan of action in place, it takes no time at all for your “ultimate crawl to top all crawls” turn into a soggy biscuit of a night out. Pub Stop One: The Craft Beer Co. Your epic journey of laughter, lager and lads begins at Craft. With Brighton’s largest collection of craft beers, wines and spirits, and a warm and welcoming atmosphere, there’s no better place to begin your quest. Five minutes up the road lies Trafalgar, a traditional, homely pub. What sets this pub apart from its nearby competitors is its spacious beer garden, perfect for soaking up the summer sun over a refreshing pint. Head on over to this classic little pub that specialises in Bourbons and American Whiskies. The staff will be happy to assist in your choice of beverage! On a Thursday night this quiet pub livens up with live music performances. This is where the pub crawl starts to heat up. Take a short trip up the road to Brighton’s largest beer garden. You can expect some noise from the PA System and a crowd of people looking for a jolly good time. North Laine has it all. A bustling atmosphere with strong tunes to groove to, and more importantly a selection of fine craft beers that are brewed in house just a few feet from the bar! Just a short distance from the Royal Pavilion lies Brewdog where you can find thirty taps of the best curated craft beer! Brewdog boasts a truly eclectic and cheerful vibe with a large selection of tasty bevvies. Time to stop at Brighton’s largest public house, Ye Old King & Queen. This pub has a long history dating back to the 18th century. You’ll find a large selection of affordable lagers and ales, a big screen (usually with the footie on), pool tables and another beer garden. Cheap and cheerful! Eighth stop in and your wallet is probably as empty as a politician’s promise. That’s exactly why The Pavilion Tavern is en-route. A quick stop here ensures a cheap drink and a cheeky dance off to the resident DJ’s spins. Featuring an intimate atmosphere, loud sound system and quirky outdoor terrace area, Hop Poles manages to blend kooky and traditional into one perfect little pub. If you fancy yourself at video games, you might be able to hop on the N64 for a quick sesh of GoldenEye too! The end is in sight, but not before your final visit to Brighton’s number one Irish pub, Molly Malones. You’ll find live music every single night of the week in a cracking central location, with one heck of an atmosphere. There we have it. 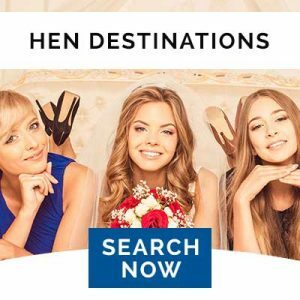 A challenging, eclectic and entertaining Brighton pub crawl that is sure to test the team spirit, stamina and stomach of every member in your stag do squad. Just remember to stock yourselves full of food before setting off on your quest for thirst, fun and mischief! We’ve mapped your pub crawl on Google Maps here.